Our quaint beach bungalows are inches from the ocean, with no roads between the rental and the beach! Right next to the bungalow there is a shared patio to enjoy with a barbecue, fire ring, large grass area, and sandbox for the kids, all with the beach as your backdrop! 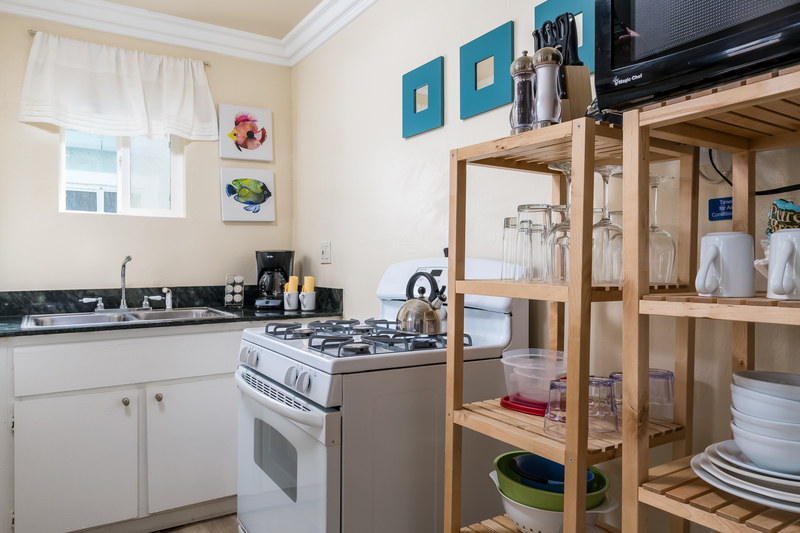 Each unit has its own adorable kitchenette with a refrigerator and oven/stove. Kitchen utensils, towels, & linens are all provided. Wall unit AC. This particular bungalow faces the beautiful courtyard area. Overflow parking is available at our office in Oceanside, located at 1640 Oceanside Blvd, Oceanside, CA 92054. These units are perfect for romantic getaways, a gathering with friends, or for a small family. And you'll fall in love with the laid back beach town of Oceanside. 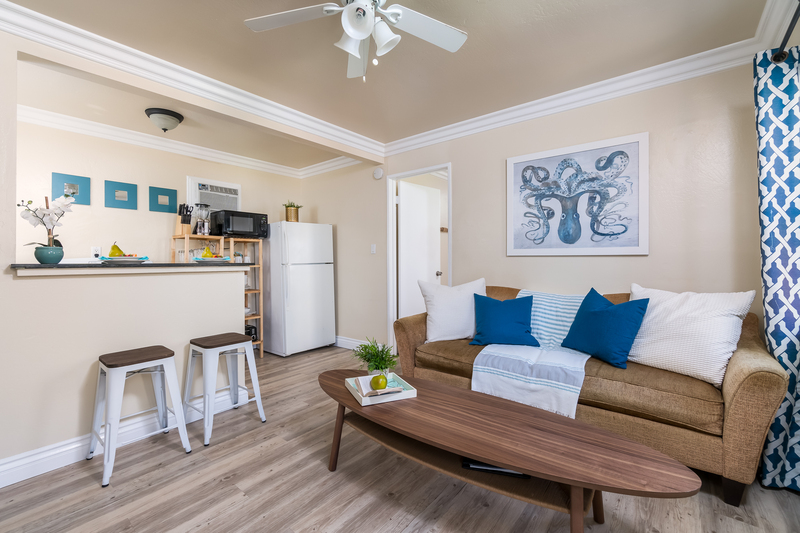 The vast ocean views and sand, year-round beautiful climate and adorable downtown attractions make it the perfect setting for a beach getaway. After falling asleep to the sound of rolling waves, you'll awake refreshed and relaxed. Spend your days at the beach, or explore the other coastal attractions (ie: Mission San Luis Rey) Oceanside has to offer. Check out the California Surf Museum, or take a stroll down the Oceanside pier at sunset. You could even take a sailboat out on the harbor! You will not find a better deal on a beachfront vacation rental! Recently retired and needed a place to breath. Was just what we needed, right size for two, very clean, kitchen had everything needed, the fire pit was used every night watching the sun go down! We loved it!! In spite of the weather, a great time. This really is a charming bungalow right on the ocean. We happened to visit during the worst weather in years. The few nice days, we enjoyed sitting around the fire-pit enjoying the sunshine and walking along the beach to the Oceanside Pier for lunch at Ruby's diner (great place). It was an all-around enjoyable experience.I'd do it again. Small cottage, perfect for two, just steps from ocean. Short walk along the strand for sandy beach access. Nice, shared sitting area at front of property, to watch the surfers and listen to the waves. Cottage was equipped with everything needed for a short stay. Only negatives were a lack of counter space for meal preparation and area for storing your food supplies. Two shelving units held plenty of dishes, glasses, bowls, etc. but a nice size cabinet with a work space on top and shelf on the wall would have provided better storage space and a much needed work area. The small a/c unit did an adequate job of cooling the living room area during a hot week in August, but it was too noisy to leave on at night. 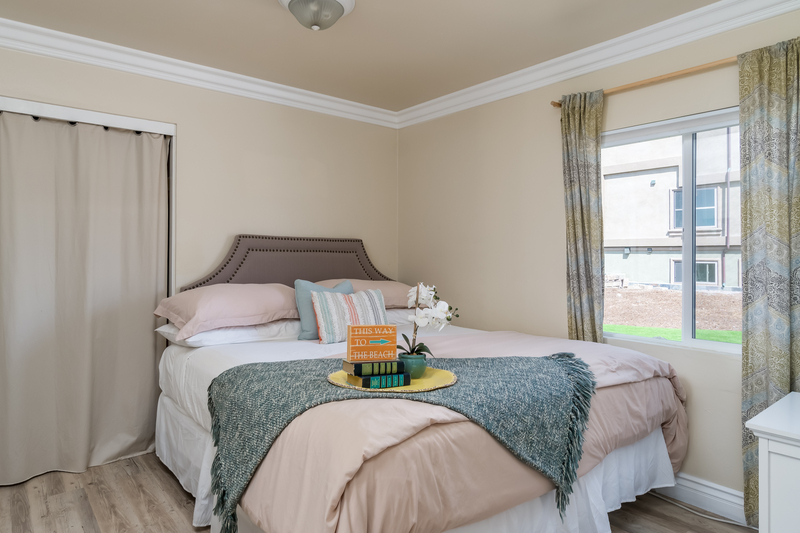 A ceiling fan in the bedroom would have helped circulate some air for a more comfortable nighttime with the windows needing to be left open. There was a small table-top fan that helped. Had to call management, who were very quick to respond, to request a fly swatter due to many flies, which appeared to be getting in through some places in the window screens. Was nice to have a parking area, however, it was a distance from there to the unit around the building and down a very steep slope so it was a bit difficult to get suitcases and ice chests from car to cottage. We really enjoyed the space and property. The staff were quick to respond and extremely helpful. The location of rental is perfect and we really enjoyed our stay. It was a quiet, relaxing getaway. An easy walk to the beach and pier. Calming sound of waves crashing on the beach. Perfect weather all week. Room was as expected - small, but comfortable and with all the amenities I needed. Great stay in a cozy beach front cottage. The BeachFront Only staff was very friendly and helpful. The cottage was clean, cozy, and made for a very comfortable stay. We enjoyed the gas firepit in the common area and it's a great location steps away from the beach. I look forward to another family trip very soon. The bungalow had amazing views, can’t get much closer to the ocean! The kitchen is perfect for cooking some meals and there is a grill available as well. Plenty of towels/extra blankets and fans available. The shower is pretty tiny and not ideal for tall people. My only complaint is there was a full garbage on patio when we arrived and empty beer cans in the fire pit. We called when we arrived and they sent someone over to empty garbage right away, however they did not pick up all of the beer cans. Otherwise great stay! From booking to checkout we had a great experience with the turnkey style service. The beach bungalo was perfect for the two of us. Proximity to pier and downtown Oceanside was perfect and yes the beach. Parking was also easy, no issues and always had a spot. Patio was nice place to hang out and enjoy the sunset. I didn’t want to leave! What a great little place. Location is great —right past the traffic but be aware you are on big rip-rap boulders, not sand. Perfect for me! We had a wonderful time staying here on the beach! Great views, great location, great patio amenities! We would definitely stay again and recommend to others. Thank you! Small place but great fun! The patio is wonderful...right on the ocean. Short walk to sandy beach. Great to hear the waves on the rocks. Accommodations were nice. This is our 4th stay in this unit. Loved the fresh paint and new furniture. Favorite part of the stay is the ocean front patio with comfortable furniture. Great way to start and end each day watching the waves roll in. 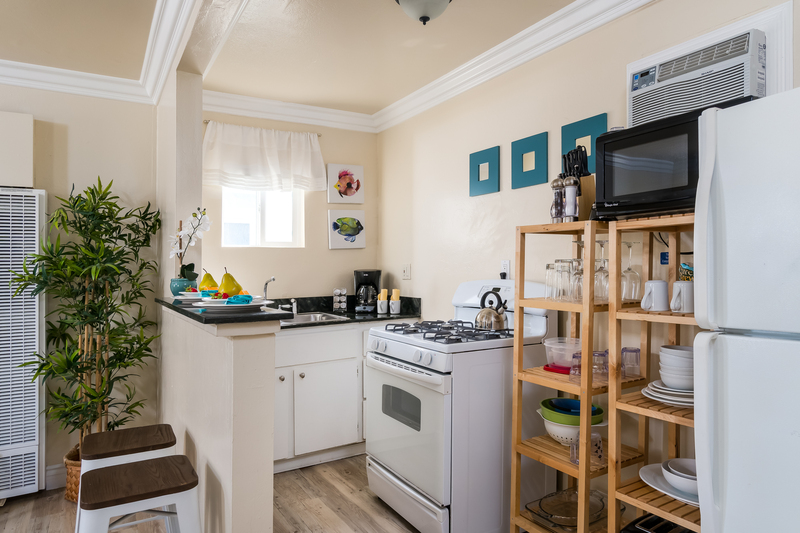 My wife and I were blown away by this charming rental space, right on the ocean! Th best hidden Treasure - Little Blue cottage right on the beach! My wife and I had a fantastic time!! We will be booking for another vacation stay. We met some wonderful people and just loved everything about staying in the cottage by the ocean!! We really enjoyed ourselves; great view; very nice and clean bungalow. No beach there. Ocean front, which was lovely, but you have to drive to a beach. Enjoyed our stay. The unit was clean however I felt the grounds, common areas could be better maintained by sweeping the area daily and wiping the chairs and tables off. Glad we brought our own food storage bags since there were NONE in the unit. I would stay here again. Thank you for the review Paula! It was our pleasure having you stay at our beachfront property. While we do provide you with a lot of the basic items to get your started, we also provide a list of items on our website (under what you need bring) that you will need to bring on your trip which includes saran wrap, baggies and foil for left overs. We don't provide maid service so unfortunately we can't provide items that cannot be restocked on a daily basis, we do provide some basics items to get you started such a toilet paper, paper towels and cooking spices etc. We have also updated the common ground areas to include gazebos that can be rented out for special occasions. we appreciate your feedback! Thank you for review and we hope to see you all again soon. Cross country road trip from Rochester, NY with many stops along the way. Rental was as described, very clean and updated. Just steps away from ocean. Kitchen had everything you wanted for a quick meal. The bed was very comfortable. Met a couple that had been there for a third time. It was great ! The only issue was Refrigerator sucked! Great loved it. Coming back soon! Only problem was parking. Beachgoers would steal parking during the day, we almost left a day earlier than planned because we could not park to get to our room! The room was clean and lovely, but it was obvious it wasn't done just before we arrived, no big deal though. There is a washer and dryer on site too. Next trip I hope to give a full 5 stars for everything. My wife and I stayed here for 3 nights for our 40th wedding anniversary and quite enjoyed the time here. We were able to walk the beach, listen to the breakers hitting the shore, and had a quiet, enjoyable time. We accidentally switched digits when entering the door lock code and the property management person on the telephone quickly helped us realize our mistake and we got right in. My wife also tripped a breaker with her hair blower running in the bathroom while running a space heater in the bedroom. Someone appeared within a few minutes and reset the breaker for us. Overall we had a very good experience and enjoyed the property! It was a good price and fit our desires very well. I really can't say enough great things about the cottage. It was immaculate. It was quiet and had a beautiful view of the ocean. Even though the kitchen was small, it was equipped enough that we were able to prepare meals. It was in a great location, too. Unit was fine. Small but clean and nice location. Not sure I would rent through this agency again. I found it extremely clunky. I am old and not high-tech so allow for that. The perfect location for us!!! We had everything we needed at an affordable price on the beach!!! We will definitely rebook in the future!!! Great location, cozy and comfortable cottage. FULLY equipped! Can't wait for next visit. We were thrilled with our experience there and will definitely be back. Got a great price on Groupon. We were a little dissappointed because we thought the pics on Groupon was the condo we were getting. But it was nice anyway. We enjoyed our stay. Pros - steps from the ocean, clean comfortable room, great location, kitchentte. Cons - small, no ocean view from room, TV too small and no DVD player. Overall an excellent deal and satisfied. Kellie, Thank you for the review! We are sorry you were disappointed with the actual unit you got vs. the photos on Groupon. We will work with groupon next time to make sure all the photos are clearly labeled with the room type. We had everything from a 5br to a 1br, so all the photos on groupon showed the various units, they just weren't labeled with what size they were. We do have a couple oceanfront 1br's if you ever want to come back and look straight out the beach from your unit! Nice amenities in the patio and fire pit. And the sandbox was a great place space for my kids. Cute beach cottage. We'll be back! next I'm bringing cold cuts. Place was great, clean comfortable with a great location. Had a very nice time at the bungalow. Looking forward to returning soon. Had a great time. Rental was clean and in a great location. Steps to the beach and great restaurants nearby. Street fair on Thursday was also great. Couldn't have asked for a better time. Already planning our next trip. Single story rooms were great for beach access. My husband and I had a great time staying at the bungalow in Oceanside. We found it very inviting, exceptionally clean, and comfortable. We really enjoyed the convenient location--just steps from the beach. The management company was very helpful and friendly when we called them with questions. Even though it states that you can have up to 4 guests, I would suggest that it really is perfect for two people and would be too crowded for four. I would certainly recommend this property to a friend or relative. We enjoyed visiting the cute town of Carlsbad and walking to Ruby's Diner at the end of the Oceanside Pier for a hamburger and wonderful shake. It was a very relaxing and enjoyable vacation. Our place was a perfect little beach condo. Making our reservation was extremely easy and were pleased with all the information they provided. Location was perfect with the beach being so close and the pier in walking distance. Would recommend to anyone looking for the perfect beach condo. The charming bungalow was a little slice of paradise for our family of 4. the beach was close enough to pop back to the bungalow for lunch. The sandy spot was perfect for making sand castles. The patio was wonderful for watching the sunsets and making s'mores at night. We were pleasantly surprised to be able to park nearby every day we were there. The bungalows get a little warm in the afternoon, but who wants to stay inside when you're at the beach??? The place was clean and well equipped. It deaparately needed a ceiling fan in the bedroom. There was no cross breeze and it was stifling at night. The floor fan provided was extremely loud. Otherwise it was perfect. Right on the beach. Staff was helpful and unobtrusive. Thanks. We stayed in #6 and had a comfortable stay. 2 ad 2 kids. 1 bed and a futon. It was cozy. Nice kitchen with utensils and glassware. Full size fridge. Not a lot of room for eating but there was a small bar table. The beach is footsteps away however it was very rocky and we had to go to a different beach to play on. You can walk to the pier which is just about 1 mile away. The commons area with a gas fire pit and bbq was very nice to have in the afternoon. parking is easy on the side of the condos. I suggest a hot tub for guests only!! Great place and location. Access to the beach was excellent, and the patio was used daily. Walked to different dining spots almost daily. We will be back. Very affordable. Accommodations were all we needed. This is an adorable little complex in a great location! Oceanside is an amazing little community the recommendations in the guest book were all amazing (I highly recommend the beach break cafe and cream of the crop grocery store). The unit was well stocked and the common area had some beach toys an boogie boards for the kids. I would absolutely go back! There is parking on the South side of the complex along side of the unit on the West side of hayes street. There is a lot of signage saying no parking and there was not clear instruction in the arrival information to indicate where parking was permitted. Another couple in the unit inquired with customer service and this parking is for the rental unit and the signage is to deter public parking. It would be nice to have this information marked up on a map prior to arrival. Thank you for a great stay!! We enjoy being so close to the beach and hearing the calming and relaxing ocean waves as we drop off to sleep at night. It was high tide all week so we were unable to sit right on the beach that was located so close to us. We did enjoy the beautiful patio and chairs, the cleanliness of the apartment, and the quick response to maintenance issues. We spent three days In this little hideaway Everything Washington great Thanks for this relaxing time! We had a wonderful stay at our rental. It was small but it had everything we needed for our family of 4. The bungalow we stayed in was very cute, clean, and comfortable. We loved sitting on the patio to drink our coffee and stare at the ocean. We were able to see dolphins multiple times during our stay. The beach access was also very convenient and not too crowded. We are definitely coming back!! Love the area , fire pit was great to relax by. Have told quite a few people about stay. WE had a great time. The cottage was what we expected and more. It was a well kept property and the inside of the cottage was perfect for us. The extras such as the space outside the door, available parking (Yes it was available), the patio area-- all were great. One of our best vacations- EVER! My husband and I were looking for a pet friendly place close to the beach! This rental was better than we imagined it would be! Cleanliness is very important to me and this place was CLEAN! It had cute decor and everything worked as it should! We appreciated having the stocked kitchenette and utilized the BBQ grill during our stay! We absolutely LOVED the patio area! We saved a lot of money by bringing our own food and using everything supplied in the kitchenette! (Meant a lot to me that we were given a new and wrapped kitchen sponge to use for our dishes! A small touch that means a lot!). We slept like a million bucks in the comfy bed and to the sound of the ocean waves every evening! I took many walks with my dog along the strand! It was the perfect time of year for our stay. The weather was PERFECTION and it was very quiet! The shower is pretty tiny BUT the place was so great that it didn't bother us! We will definitely stay again! We can't wait to go back!!! We were so comfortable in our home away from home. We could not believe how close we were to the beach. We loved the fire pit. After a fun day we spent a relaxing evening surrounding the fire. Cute little condo. Everything was neat and clean. Could use a little table to sit at for eating and the sofa was a little awkward to sit in. The bed was broken so our first night was less than satisfactory. We had some difficulty contacting the management company but when we did, they were extremely helpful. The mattress has been replaced and we were compensated for the inconvenience. The management company and owner were apologetic and wanted to make it right. I would definitely go back again. It was refreshing to have such great customer service. The stay was wonderful. Cute, quiet studios. Once we got the hang of the parking situation and how to work things it became more comfortable for us. The management responded quickly through text and the issues with tv and internet were resolved promptly. The only issue we noticed was the community area was not monitored, so one night a guest invited 6 families to visit which made it uncomfortable for us. Since they took up most of the space and chairs. We opted to hang outside our studio as a result instead of by the fire pit. So are guest allowed to have parties and invite outside guests? Would be my only question. Otherwise, the other nights stay seemed more quiet and enjoyable. This is our 4th years here. We always stay in this unit. The location is perfect. You can walk to nearby restaurants or ride the bike to the pier. It's peaceful and quiet. My 42 days today was exceptional being so close to the ocean. The unit while small was more than large enough for my needs as a senior person with a dog. The staff could not have been more friendly and helpful. I plan to revisit next winter. I expected my rental to be facing the 'beach' but it faced a short walkway to the ocean - a sandy beach was not far but huge rocks were stabilizing the shoreline at the location of my rental. Not a problem for me though as I was exploring all day & into the evening - really only slept there. The room was clean and comfortable. The location was great for access to the beach and restaurants. It is located in a great area for walking ad other fun exercising. Great time, enjoyable courtyard and close enough to hear the waves at night. COZY OCEAN FRONT COTTAGE -- IT DOESN'T GET ANY BETTER!! We stay every year and we are very happy, it is cozy and right on the ocean, it doesn't get any better. Love the firepit.. we bring portable shelving for storage for clothes or whatever food. We have stayed in cottae 9 and 6 and have been very satisfied. Portable shelving in the bedroom would be great as we come for our feast and we have to bring dress and casual clothes.. I would not have to bring it from Cottonwood. The rug needed to be cleaned as it had stains, but we overlooked that and were very satisfied. We will be back again. All the staff has been great, and I have referred several people from AZ. and even showed our room to people that stopped by and told them to call you.. thank you again. 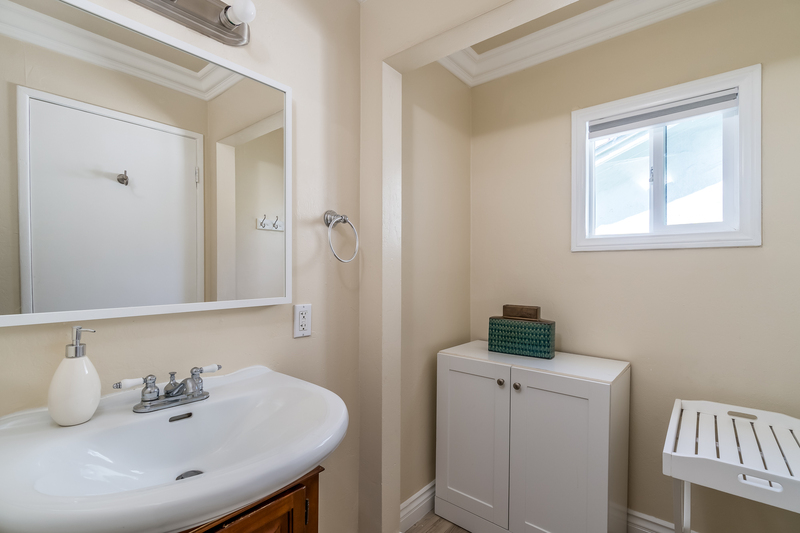 Great location, clean, reasonably priced. This unit faces the grassy area which was nice but we would like to get one that faces the ocean next time. The location was great -- just south of where the boardwalk ends, so you are close enough to experience the craziness, but removed enough so you can escape it. At first, we were a little disappointed that the ocean was crashing on the rocks i.e. there was no beach, but as the tide rolled out, the beach appeared and if you walk two blocks north or south the beach appears. The only other minor issue was that late in the afternoon, the apartment became very warm, a couple large fans would do the trick. Otherwise, the deck and the lawn were perfect areas to hang out for my wife and I and our two kids. 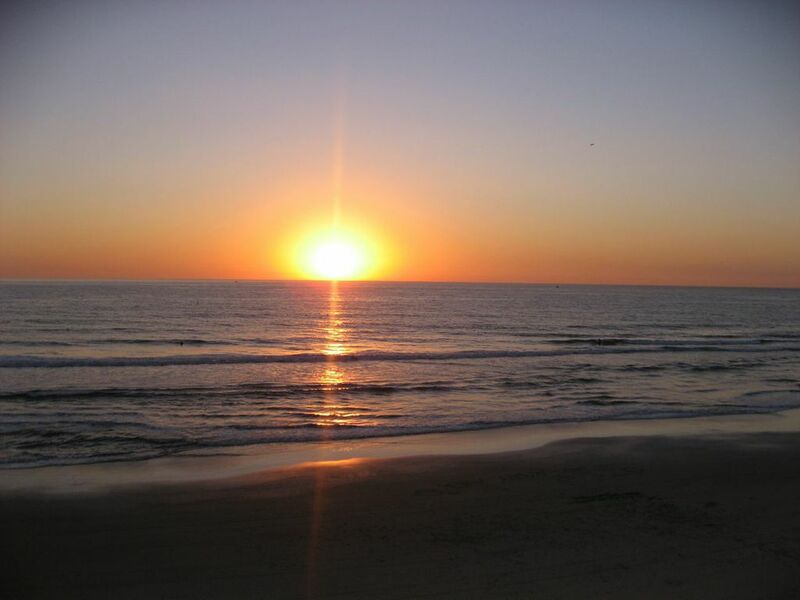 Oceanside is a charming beach town with lots of great things to do. Fishing off of the pier was a highlight as was just beachin' it. We also rode the Coaster train into downtown San Diego -- another fun thing to do. We usually stay in Coronado, which is quieter, O-side is more fun. Parking was available, room small but clean and charming, property is in a great location. Peaceful, quite and amazing view of the beach. Thank you! It was abnormally hot when we went and I called for an extra fan, because it was so hot i was snotty...they brought me a fan and everything was great! Just spent Sunday thru Friday at your Oceanside Property on the beach. We hit a hot spell, which was great, when outdoors lounging in the common area adjacent to our bungalow. Other than it being very warm inside the bungalow due to the hot spell, the stay was a delight in every way. Very clean and comfortable. Location was exquisite right on the ocean. Definitely would recommend this to all. Sweet - a great find! Great little cottage just steps from the beach. Opens on to sweet courtyard and common area that provides ample places to sit, lounge and grill, as well as enjoy the gas fire pit in the evening coolness. Bed was a bit soft and the kitchen is tiny - -but well-stocked and clean! Having stayed in Number 9 for a month in 2011 and a month in 2012, Number 6 is a completely different experience. It is small, cute, but if you didn't make yourself walk out to see the ocean you would not know it was there. Patio is great, though, for viewing ocean. Thank you for your review! #9 as well as #4 are definitely our premier bungalows! We'd love you to come back and just book well ahead so you can stay in #9 again! Our unit was delightful except for the heater in the bathroom which did not work making for very cold showers. Plus our heater broke on our last night's stay and management was unable to fix it. They gave us a heater but it only heated the front room which left the rest of the unit very cold. Understandably such things happen, but it did put a slight damper on our stay. This place is perfect! It is right on the beach and there are tons of places to eat and shop nearby. We will be returning again. This time we will bring our adult children and grandchildren. This is the perfect family getaway. Thanks so much! Our stay on a wonderful beach, in a great community! We love staying at this property. I believe this is our 4th time. This property isn't big and fancy, however the rates are perfect and the bungalow was wonderful. Our son lives in Oceanside. With all the benefits of staying here, we are able to see our son more often and enjoy this beautiful beach too. What a win-win! My wife and I really enjoyed our stay at your property. The facilities were very clean and up to date. The only item that would need attention, is the shower. Even with the door closed, water leaks out to the floor from the bottom of the door. We look forward to staying at your properties in the future. We had the BEST stay in our bungalows in Oceanside. I was nervous about reserving sight unseen cabins in a town I had never been to but it was so much better than we expected. Everything we needed was provided, they were so clean, loved the proximity to the beach and really loved the gas fire pit to sit by on the chilly mornings and late evenings! We met some great people who were staying there as well. All in all, we cannot wait to come back! This was our first time to Oceanside, and we will be back! The resort was right on the beach, they allowed dogs, super clean, and very professional staff. The resort is very close to restaurants and the boardwalk. We would definitely recommend this place to friends. Love the 2 days and I wished that I could have stayed longer. The BEST vacation I've ever had. Very satisfied and I'm coming back and all my friends asked me about it. I've posted all my pics on FACEBOOK. Highly recommended this place to all my friends. WE had a good time. Had a few problems with fridge and ovens going out. However they were fixed very quickly and professionally. We would certainly recommend the stay to others and have done so to several friends already. You can't beat the patio right on the Ocean. Kids loved it and it was enjoyable to grill and dine while the waves were crashing before you. A nice time. Bring your sunscreen. I expected more for the price. This was a very small unit with run down living room furniture, no dining area, outlet near TV didn't work & cable didn't reach to other outlet. Old shower with door ajar. Nice stay close to family visits for Thanksgiving. Would stay there again. We had a great time! The rooms are very clean. The beach was awesome! And sitting at the firepit every night was so relaxing! We can't wait to go back! Great beach bungalow on the beach (no road in front of you). Everything you need for a relaxing vacation. Hope they never change to a high rise!!! I was so pleased when we walked into the rental unit. It's small, but had everything we needed. We discovered the heater didn't work about 9PM Sat night. We called, and within 15 minutes a maintenance man came and fixed it! Wonderful service! The unit was SO clean. The location was SO beautiful. The firepit was awesome. Thank you again for a great tiime. Thank you for everything!! Trip was amazing! Overall, the vacation rental was nice. My family and I had a great time and the beach was just steps away! We will be staying here again. The family loved the location. Great place to stay. I will definitely be back in the near future. the only thing was negative there is no air-conditioning in the unit and it was so hot.When we were coming back from the beach and unit was closed there was no relieve from hotness!Icould not even rest at night cause of that!Only later towards morning was bearable!! !And fan did not help much!Otherwise it was nice place on the beach! was clean and have everything you need for cooking. Great!!! One very important - Please place a small Table and fold up chairs in the unit. It is difficult, if not impossible, to eat a meal in the unit. There are TV tables but they do not work due to the fact that the furniture is so soft that you sink into the couch or chair. Other than that all Great! We had a fabulous time! The condo was equipped with all the accoutrements of home-style living. We were able to fix our own meals and done without going out. The outside shared patio was very comfortable with furniture, umbrellas and fire pit as advertised. We look forward to a future stay! Super relaxing time enjoying a fire pit, comfortable patio area, with a great view! The pier was a bit of a walk away, but there are many restaurants a short distance away. We brought bikes to travel along the coast to the harbor. The property was nicely decorated and comfortable. My kids enjoyed the lawn area and sand box adjacent to our room. Its a perfect area for them to play and still be under our watchful eyes. We had a great time and I can't wait until we can come back! The experience was perfect. House right on the beach, what can be better?! My girlfriend and I had such a awesome and relaxing time, just what we needed.